Okay. Let me give you a little glimpse into the way my brain works. 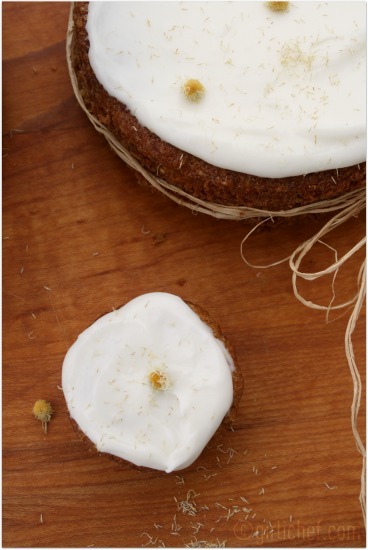 I see something with the title "mini chamomile cakes with honey frosting" and promptly pull out my mini-cupcake pans. Mind you, I did this with my advanced-advanced copy of this glorious cookbook. And, fancying myself a considerate host, I decided to let 21 other people know that they should dust off their mini-cupcake pans, as well. Yup. Feelin' good. So I stir up this simple batter. Simple, yet packed with the glorious, green, and grassy notes of dried chamomile. Life is good. Yet I think ...hmmmmm? This looks like an awful lot of batter for something that is supposed to only just fill 12 cups. Halfway. Sure enough, I fill 12 of my mini-cupcake cups. And then I fill 12 more. And I still have a lot of batter left. So I do what any space-case would do and put some more batter into each cup. This means the "holes" are a good two-thirds of the way full. And yet...there's still more batter. Lucky for me I have yet another mini-cupcake pan. So I fill that one too. And then I lick the good amount of batter still left in the bowl. I must be good. I've really stretched that batter! Let's just say - I'm not good. Think Mount Vesuvius erupting and the lava that has flowed over the edge then left to form a crust over the top of, say, a parking lot full of cars. Now imagine trying to pluck the cars from that parking lot. Yeah. Not a pretty site. Much like my highly anticipated pans of mini-cupcakes. Okay. What did I do? Where did I go wrong? Open the cookbook. Stare at the page. Re-read the page. Twice. Notice that nowhere on the page does it say mini cupcakes. It says mini cakes. Mini. Cakes. CAKES! Sh*t. It says cakes. It says...and I quote...makes 12 mini cakes or cupcakes. My mind told me to make mini cupcakes. I mean really, this shouldn't have been an issue. If only I'd stopped filling them at halfway I would have had a perfectly beautiful - if abundant - batch of mini-cupcakes. It was my genius idea of adding more batter since I had some left. I quickly tucked my tail between my legs and wrote another letter to those fantastic 21 people telling them that they, in fact, did not have to dust off their mini-cupcake pans. Unless of course they wanted to. This, ladies and gentlemen, is how my brain works. And since I couldn't really shake the thought of making these cakes in micro-miniature, I started over. And this time I made a big ol' batch of tiny cupcakes. Plus one big one. Just because. Big in that it's bigger than a cupcake...say 4½" across. So still mini enough to be fun. Can I help it that these just screamed dainty to me? No I could not. Because.... that's the way my brain works. Exactly. When I finally got it together, they were everything my heart desired. Beautiful. Tasty. Dainty. And totally ladies-who-lunch. 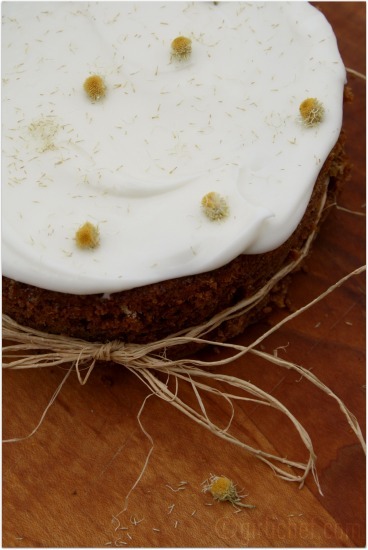 Dainty chamomile-infused cakes with honey frosting. Preheat oven to 325° F. Line a cupcake pan with liners or grease and flour it. Set aside. Cream butter, flour, sugar, baking powder, baking soda, salt, and chamomile together for a few minutes; mixture will be coarse and sandy. Whisk milk, egg, and vanilla together in a large measuring cup. Pour half of the milk mixture into the flour mixture with the mixer on medium-low. Beat until just incorporated. Add remaining milk mixture and turn speed up to medium. Beat for about a minute, until well-blended and fluffy. Divide batter into prepared pans, filling each cup about halfway. This mixture makes exactly enough, so use a rubber scraper to scrape all of the mixture from the bowl and into the pans. Bake for 17-20 minutes or until a toothpick/skewer inserted in center comes out clean. Remove from oven and allow to cool in pan for 10 minutes. Remove and cool completely on a wire rack. Whisk together sifted powdered sugar, honey, cream, and salt until smooth. Adjust consistency with a bit more powdered sugar if it seems too loose or dribble of cream at a time if it seems to thick. Spread generously on top of cooled cupcakes. Sprinkle with a bit of loose chamomile as garnish, if you wish. Will last, well-wrapped at room temperature for up to 3 days. 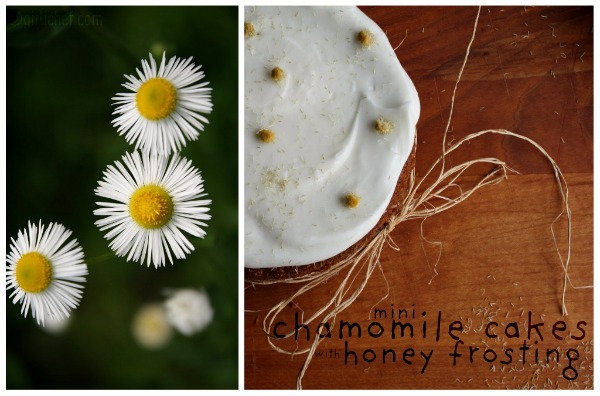 I'm thinking that one of the main reasons I wanted to make these so badly is that I grow chamomile in my yard and then pick and dry it at the end of its season. I wanted to use it and I wasn't taking no for an answer. I did decorate with some flowers that I had not yet ground in my spice grinder. While they're pretty like this, you don't really want to bite into one this way...so pull off that little yellow center before biting in, if you decide to use them!